This blog post is by Stephanie Rancourt. After a successful career in AAA engine and game development, she left to work on her own game, Deep Space Settlement (D.S.S.). This one-woman engine team built a 250,000 line engine for a vast and impressive space game in a matter of a few years. She inspires me greatly. Please follow her on Twitter at @StephanieRct and buy her game at http://dss.stephanierct.com/ . In D.S.S. 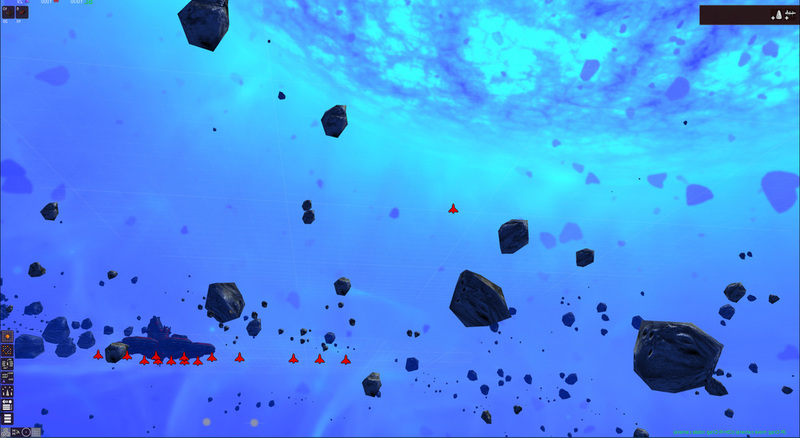 I have to handle tons and tons of ships and projectiles in many star-systems. Consequently, if I want a decent framerate I'll have to multi-process all this to take advantage of new multi-core CPUs. So without further ado, here is how I did it. It's actually a pretty standard way to do it. It's just the simplest way I could think to implement it. I'll be using common primitive like mutex, event and thread so I won't go into details for these classes. I'm using FastDelegate library as well cause I just like it a lot. The model is basically: queue a bunch of tasks (or jobs) and process them with several threads. The magic happens in 3 classes: JobQueue, MPWorker and MultiProcess. This one synchronizes job addition and retrieving. It really just acts as a synchronization primitive. This guy process job from the JobQueue. There are usually several of them spawned at initialization time. They literally fight each other to get and execute jobs. They are pretty good workers indeed. MultiProcess just ties everything together. //This job queue is implemented with a mutex for simplicity. A lock free queue would yield better performances. // a volatile pointer would probably work as well. bool mbWorkInSingleProcess; // if work in single process, job are executed when added. otherwise they are put in the job queue. Be aware that if your jobs are too small, the overhead of adding and getting job will be quite high. For instance, in D.S.S., I update whole star-systems in a job. Updating each ships with its own jobs would be terrible. Also, as ships usually interact only with other ships in the same star-system, I don't have a lot of synchronization to handle. Here's a screenshot of the multiprocessing at work. It's running on a 6-core HT Intel CPU, there are 11 worker threads updating 100 star-system in this galaxy. Each "CLJob" box is a system being updated. Click here for the full code with VS 2010 solution.